A: The benefits of earthbag building are: inexpensive; easy to learn and build with; ecological, using mostly earth; versatile in building styles possible; durable; earthquake, flood and bullet resistant; can be either insulation or thermal mass; non-toxic; uses a simple foundation. Any dome uses very little wood, steel, or concrete to build, thus eliminating the need to use these materials that have an adverse affect on our environment. Q: What makes them better? 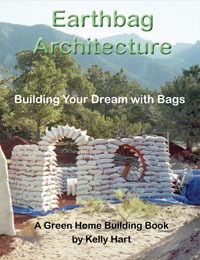 A: The benefits of earthbag building include lower cost for materials, thicker walls that are more secure from the elements and provide insulation from noise; they are generally a more sustainable choice because they mostly use natural, non-industrials material; the process of building is easily learned and can mostly be done by unskilled labor; often it is possible to build on a simple rubble trench foundation. The problem with earthbag building is that it is sometimes it is difficult to get local building authorities to accept it, and you have to be careful to properly engineer the building and finish the bags with an appropriate plaster. How long can a sandbag house last? An earthbag house can last a very long time, since the earthen material in the bags will not deteriorate, similar to all other earthen building methods, so they can easily last for centuries if properly maintained. Are they rain, flood, wind or fireproof? Yes, they can withstand all of these hazards better than a conventional house. Q: What are the pros and cons of earthbag housing when compared with traditional housing, rammed earth housing, and strawbale housing? A: Earthbag building is more sustainable than most conventional building in the US because it minimizes the use of energy-intensive industrial materials, and can create very energy-efficient building shells. It is also more economical to accomplish, and takes less skilled labor. And it is remarkably variable in the forms that can be created. Earthbag housing is similar to rammed earth housing, in that they both may employ the same type of soil to build the walls. On the other hand, earthbags are easier to fill and stack than creating forms for ramming and then actually ramming the earth. Furthermore, the walls can be curved, which is difficult to do with rammed earth. Also earthbags can provide either insulation or thermal mass depending on what they are filled with, whereas rammed earth is always thermal mass. Compared to strawbale building, earthbags typically do not have the issues with moisture and rot associated with straw, so the building may last longer and be easier to maintain. When filled with crushed volcanic stone, rice hulls, perlite or vermiculite, earthbag walls approach the insulative qualities of strawbale. It is easy to create domes with earthbags, but not a good idea with straw; domes can eliminate the need for much use of wood and steel roof structures, and are therefore more ecological. Q: Is it possible for tsunami housing? A: I think that earthbag building has tremendous potential for areas prone to flooding or tsunamis because the wall materials themselves can be immune to moisture damage and can be reinforced to withstand great forces. Q: I am a junior at Black Hills State University, South Dakota and I am doing a class project on non-traditional homes and I have been selected to do mine on sandbag homes. A few things I am curious about is an estimate of cost, advantages and disadvantages. A: As for cost, it can vary a lot, depending on design, size, and many other factors...but in general it can be quite inexpensive. We built our 1,250 sq. ft. domed home for about $35,000, with me doing most of the work. Certainly economy is one of the advantages. Another is the fact that a structure can be built with very little embodied energy that might have a negative effect on the environment. Also the bags can be stacked into domed shapes, eliminating the need for a wooden or metal roof structure, and require very little by way of a foundation to build. Q: I am a family physician, part of the US Air Force. I am deployed to Afghanistan in its southern region currently. The province that I am located in is among the very poorest rural provinces here, and I am tasked with developmental work. The previous team here had an individual who got things going in the right track. When he left here a month ago he mentioned to me the idea of earthbag construction and maybe starting that project here in Afghanistan. They build most of their homes from dirt mixed with water and some kind of weed for a binder. What do you think about earthbag building here? A: I think that earthbag building in Afghanistan could work out quite well. As you say, the vernacular architecture there is already earthen, so there should be little resistance to the introduction of a method that resembles it. While building with earthbags might be a little more expensive than what they are used to, it likely has the advantage of being quicker and probably more earthquake resistant. Also, the range of soils that can be used is much greater than with most earthen methods (adobe, rammed earth, or cob). Q: I would very much like to know what materials to use for wind, fire and bullet proof when building my home...I feel we are fixing to be over run with gangs and I want to protect my family...I need a strong structure to withstand just about anything. Q: How long does the typical earthbag house last? A: Nobody really knows, since the use of earthbags for building structures like this has been attempted only in the last couple of decades. The polypropylene material, if kept out of sunlight, will last a very long time; moisture and rot are not generally a concern, and mineral fill material will not decompose. I expect the earthbag house that I built to last at least a century. In the case of filling the bags with cement-stabilized soil or good adobe soil, the bag material can actually be burned off after the house is built, because it is no longer needed structurally. Q: Can the walls (skeleton) of a super adobe dome resist a lava flow without melting and collapsing? A: It is an interesting question about the durability of earthbag construction in the path of a lava flow. I think it would depend on what the bags were filled with. As with any masonry material (like stone, concrete, bricks) earthbags that were filled with well-compacted and consolidated soil (like adobe or cement stabilized soil) should fair pretty well in these circumstances. Many people actually burn off the polypropylene bag material before plastering them, so obviously the bags are no longer essential to the integrity of the structure. But if the bags were filled with a looser material like gravel or sandy soil, and the bags were burned by the lava, then the structure might fail. Q: My main argument for earthbags is durability. Through all my driving in the Big Island of Hawaii I don't see many homes that are more than 100 years old. Yet, it is very common to see 20 year old wooden homes rotting away in Hilo. To me, this makes them disposable homes. I have a hard time of thinking of them as fixed assets like gold. 5 years ago in California, I backed away just in time from buying a $800K home in San Francisco through a 30 year home loan. I said, whats the point of going through the aggravation of paying monthly installments for 30 years if the home is only going to last 20 years in perfect condition? ( I guess they can last longer if you spend a couple thousands in termite maintenance and painting every couple of years). And if I am thinking about transferring property to a family member, I would think they have to tear down an old wooden home when I pass away. So everyday that goes by, it is becoming harder for me to think of a wooden home as an investment. A: (Molly Hart) I agree with you whole-heartedly about the sustainability issues around earthbag and other alternative building practices. It does seem crazy to build with wood where the moisture levels are so extreme, and termites are prevalent. All the lava is used for rock walls, and I haven't seen one home made out it. I have seen first hand what a short time of negligence can do in this climate to traditional homes. Q: I live in Oregon and, considering the rain, I was wondering if earthbag building is suitable to this climate? Also, how long do you think earthbag buildings last? A: Earthbag homes can do fine in wet climates, especially if you use a design that has a roof with eaves to keep the rain off the walls. Earthbag homes should last a very long time, if they are maintained...probably for centuries. Q: I'm planning to build a school in a mountain village in Honduras and I want to take the opportunity to build it as eco-friendly as possible (while also showing the villagers a new form of building). From the research I've done, I feel as if an earthbag school would work great in that area. It is a two-mile hike from the nearest dirt road (about four-five hours from the closest city), so anything used in the building process has to be carried. It's a small village, with probably only a maximum of 30 kids attending the school, so I'd probably only have to make a single school room at this time. From your experience building with earthbags, do you think this would be the best eco-friendly option for the area? A: I think that earthbags would be a great choice for building in your situation. The fill material can come from the soil beneath your feet; the polypropylene bags are fairly light and easily transported; it doesn't take much barbed wire to do the job; you can actually use an earthen plaster with just a bit of cement or lime added to stabilize it from erosion on the outside. Honduras has a hot and humid climate, so thick earthen walls will be much more comfortable than thinner walls, generally. And all of that earth will help moderate the interior humidity. Q: After the typhoon that hit the Philippines, I would like to have your advise. Which plan of earthbag building that would resist such strong wind for days or even weeks to prevent such devastating effects? A: There are many designs that could handle most any weather hurled at it. Domes are excellent for this, but they are generally not as well suited to damp climates because it is hard to waterproof them satisfactorily. Round houses are also very strong and resist the wind very well. The key to these is to have the roof extremely well attached to the walls, and this means having a solid reinforced concrete bond beam at the top that is both well connected to the wall itself and to the roof framing. Q: I know you built an earthbag house that you lived in with your wife. What was the process like of building that house? A: This was a wonderful experience. It is the first time that we had designed and built a house from the ground up, so we were able to customize it for our specific needs and aesthetics. The intention was make a comfortable house that was also extremely conservative of all resources, and I think we achieved this pretty well. So it was very satisfying on many counts. What was it like to live in in terms of comfort and heating and cooling? This was a passive solar design that naturally produced most of our heating needs without resorting to other fuel. Good passive solar design equates to greater comfort I think, because it tends to be fairly consistent, without great fluctuations, unlike a house that relies on a thermostatically controlled furnace. And this is true during the hot seasons as well, because of the passive cooling effect of thermal mass, and good insulation of the shell of the structure. Q: What makes using bags better than tires? Earthbags vs. Earthship. A: The trouble with tires is that it takes a tremendous amount work to pound the soil into the tires with a large sledge hammer. And then once they have been packed and arranged into place on the wall they don't really form a nice flat wall, since there are all of the cavities that are created by the circular patterns being tangent to each other; all of these cavities then have to be filled with plaster and/or other materials to create a flat wall. A traditional Earthship design could be built way more easily using earthbags instead of tires.